Mentoring has been shown to provide support for the development of skills and knowledge in many professions. Journalism, law, and medicine, using the mentoring process, place student apprentices in real world, clinical situations early in their training. The teaching profession has had a long history of mentoring in which a practicing teacher within a school and a professional from an educational institution provide support and direction to a young teacher in the form of “student teaching.” This article discusses the lessons learned when instructional technology graduate students act as mentors to elementary teachers in a rural school in Ohio. The transformation of graduate student mentors and teacher mentees provides inspiration for mentoring in elementary schools. Kariuki, M., Franklin, T. & Duran, M. (2001). A Technology Partnership: Lessons Learned by Mentors. 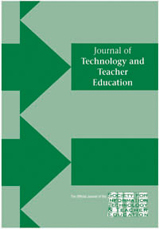 Journal of Technology and Teacher Education, 9 (3), 407-417. Norfolk, VA: Society for Information Technology & Teacher Education. Retrieved April 23, 2019 from https://www.learntechlib.org/primary/p/8375/.